You always knew you were the Ferrari sort. Or the Bentley sort. Or the classic Corvette sort. But somehow you ended up driving a minivan. Maybe you have a Mercedes in your garage at home, but you still would like to take a spin in a Lamborghini. Or maybe you are just tired of rental Buicks when you travel. It may be easier than you think to fulfill your automotive fantasies. There are many options for renting the car of your dreams. You can even give someone you love a chance to feel like driving royalty, even if only for a day. Most of the major car rental agencies rent luxury cars, including Lincolns, Jaguars, Cadillacs, Land Rovers. They also may rent "fun" cars, like the popular Mini Coopers or Mustang convertibles. You can check with an agency near you. But what if your taste is a little more exotic than a Cadillac or a Mini Cooper? 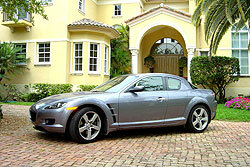 Then you may need to check out some rental agencies that specialize in special cars. You can search online for companies that rent exotic or luxury cars; you can find city-by-city listings at rentexoticcars.com. You will find something for almost any taste or budget. For example, you can rent a Range Rover HSE from Concierge Car Service in Chicago for about $329-$359 a day. If you want something a little sportier, you can opt for an Aston Martin DB7 for $799-$999 a day. If you find yourself in Houston, you might want to tool around in a Lamborghini Gallardo from Galleria Exotic Car Rentals for about $1,799 a day. If one day is not enough, you can keep it from Friday to Monday for about $5,999. Say you are traveling to New York. You can tour the Big Apple in a variety of luxury cars from Image Rent a Car. What if your car fix isn't satisfied with a single rental? If you live in the Chicago or New York areas, you can join a club that gives you regular access to luxury cars. Exotic Car Share collects a membership fee and then lets you rent from its stable of cars that includes both new sports cars like the Ferraris and the Plymouth Prowler, and classic cars like the Corvette, Camaro, Mustang or GTO. You can rent by the week or for a three-day weekend. Or you can sign up for the fractional ownership program, which gives you driving privileges in a luxury car for several weeks a year. One note of caution: Check with your insurer or the car rental agency to make sure you have adequate coverage for your luxury car rental.